My favourite Sarah Dessen yet. I devoured it. Peyton, Sydney’s charismatic older brother, has always been the star of the family, receiving the lion’s share of their parents’ attention and – lately -concern. When Peyton’s increasingly reckless behavior culminates in an accident, a drunk driving conviction, and a jail sentence, Sydney is cast adrift, searching for her place in the family and the world. When everyone else is so worried about Peyton, is she the only one concerned about the victim of the accident? 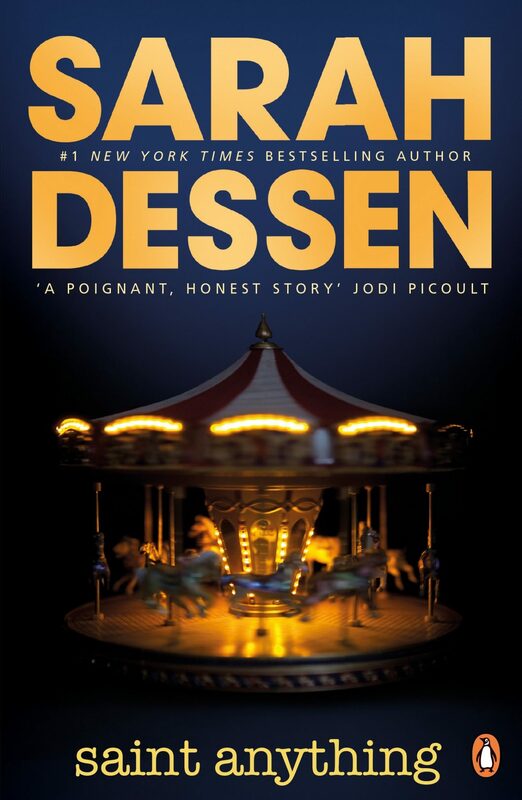 This is my favourite Sarah Dessen so far. Over the years I’ve read quite a few of her novels, and have always fallen in love with them. Last year I read Someone Like You and claimed that as my favourite (it was also number seven in my top ten books of the year), but Saint Anything has topped it. The characters in Saint Anything are incredible. There are so many relationships to explore within this novel, and each and everyone is meaningful. I think Saint Anything might be the longest of Sarah Dessen’s novels, and that means she has time to nurture every character and help us understand their actions. Sydney’s relationship with her mum made my heart hurt. Add to that the layer of complexity that her dad brings, and of course with her brother Peyton. And don’t even get me started on Ames. I loved that Peyton is so central to this story and Sydney’s relationship with him one of the most important, but for the entirety of the novel, he is only ever a voice on the phone. Beyond that, there are each of the relationships within those families and outside of them with friends – Sydney’s parents and their relationship with Peyton, Mac with his family, Layla’s with Spence and Eric. It’s such a rich tapestry of families and friends and I couldn’t get enough of it. I wanted to be a part of this group of friends. Saint Anything made me smile, it made me cry, it made me frustrated, it filled my heart with joy. I devoured it and wouldn’t hesitate to recommend it to any YA contemporary fans.